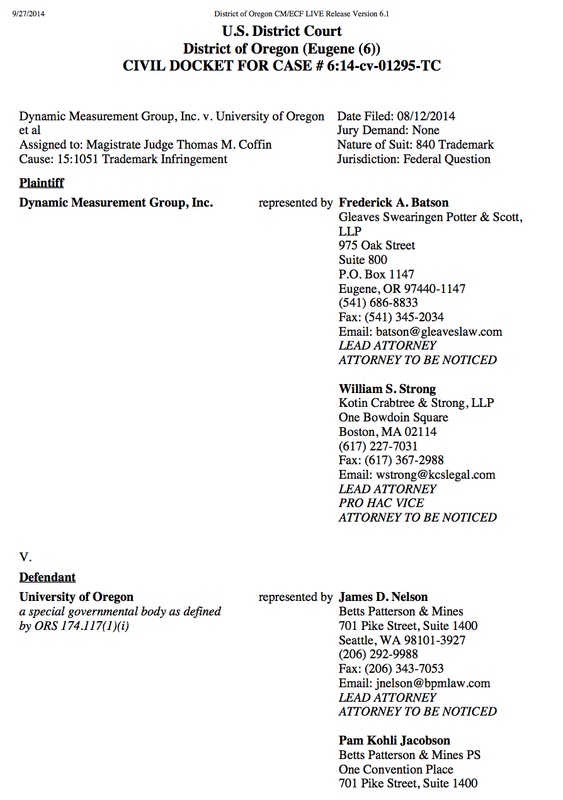 How much has UO spent on lawyers to fight our grad students? 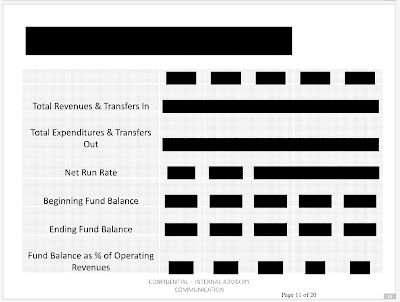 In response to questions about the total cost of the hiring HLGR for the GTFF bargaining, here are links to some public records on legal (and consulting) expenses. File dates are approximate and a mix of xls and the badly scanned pdfs Dave Hubin’s public records office sends out to make life harder, but I think I’ve got complete coverage from 2011 to the end of October. If someone wants to put together a spreadsheet for just the GTFF costs please email me a copy and I’ll post it. Sept and October 2014 legal and consulting. (new) October 2014 legal and consulting. Thanks for these accounting reports. 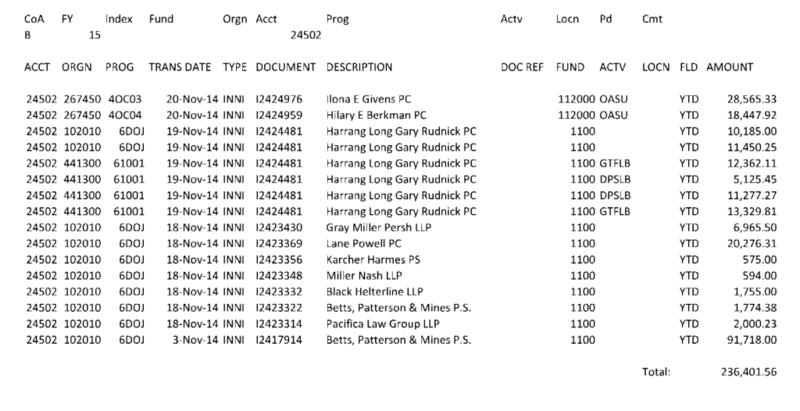 This is a public records request for the six detailed HLGR invoices with transactions dates of 24-Sep-14. I ask for a fee waiver on the basis of public interest. Because of the timeliness of issues around HLGR’s work for UO on GTFF bargaining and other issues, I would appreciate it you could expedite this request. I’m ccing Doug Park on this request as his office has these documents and can easily make them available. 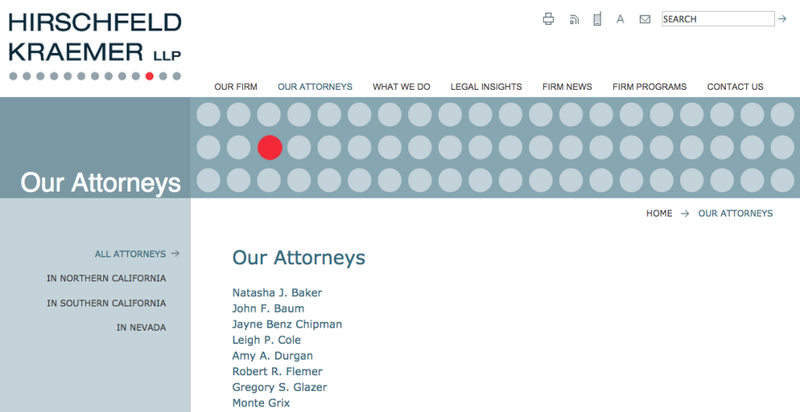 9/26/2014: Has Coltrane fired Sharon Rudnick and Frohnmayer’s HLGR law firm? One of the more amusing parts of last year’s union bargaining was watching HLGR’s Sharon Rudnick try to get her head around intellectual property issues. The UO faculty negotiators and David Cecil (UAUO) and Mike Mauer (AAUP) did their best to give her an education while she charged UO $300 an hour, but there’s only so much teachers can do, and apparently it didn’t stick. Josephine Wollington has the story in the RG about this very unusual mid-negotiation change and the positive response from the union leadership. This is great news, Rudnick and Matthews have been an expensive disaster for UO. It seems that the new leadership wants a less confrontational approach, and isn’t going to be tied to the mistakes of the previous administration. Oh, wait, never mind, this about the Eugene Public Schools and their negotiations with the teachers union. I guess we’ll have to wait to learn what Coltrane does about fixing the problems with UO’s General Counsel’s office and HLGR. Gottfredson extends union benefits to OAs, but not to GTFs. 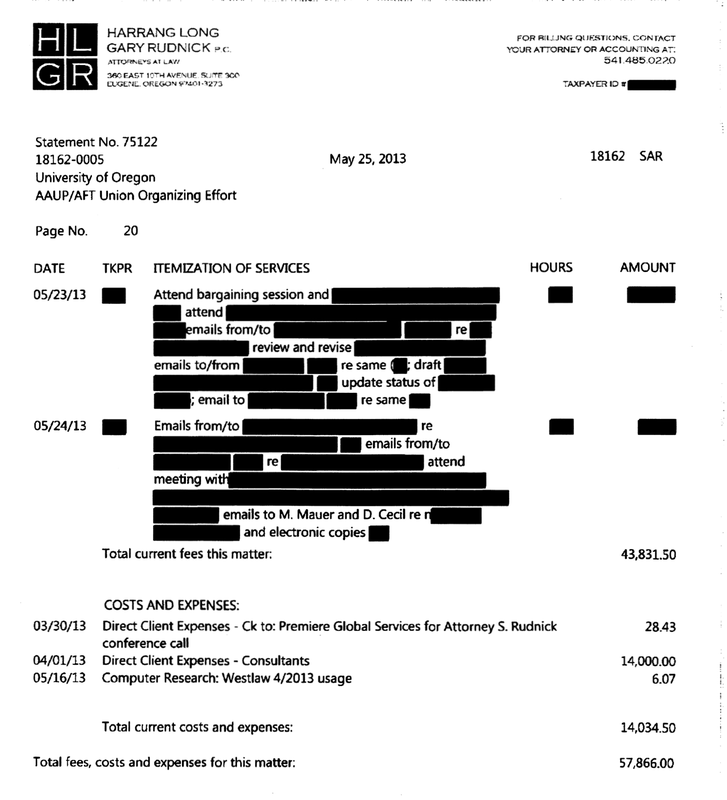 After paying noted tobacco company attorney Sharon Rudnick and her friends $1M to unsuccessfully argue “The University” couldn’t afford to give these benefits to faculty union members, Gottfredson now wants credit for giving them to the non-unionized faculty and the OAs too. His email manages to try this without once mentioning the word “union”. Classy guy. Meanwhile, he’s still paying HLGR’s zoning and easements lawyer Jeff Matthews $300 an hour to fight parental leave for our PhD students, who say they’ll strike over it. I am pleased to announce that I have enacted three new or expanded benefits allowing unrepresented faculty members (UFM) and officers of administration (OA) to enjoy more generous family leave benefits and receive a tuition discount for a second child who attends the UO, as well as expanding sabbatical compensation for faculty. I announced my intention to do so last October. We solicited public input about the policies this spring. These benefits took effect on July 1. After using available short term disability insurance benefits, all vacation leave and all but 80 hours of accrued sick leave, if a UFM or OA cannot cover the six weeks, the university will provide them with the necessary amount of paid parental leave to receive a total of six weeks paid parental leave. Each UFM and OA may use accrued sick leave for his or her remaining six weeks of parental leave. In the event that they do not have sufficient accrued sick leave, they may borrow advanced sick leave for the remainder of the last six work weeks. The new second child reduced tuition benefit will allow a UFM or OA to use their staff fee privileges for a second child who takes classes at the University of Oregon. Both children must be enrolled in undergraduate programs; one eligible child may take classes at any OUS institution but the second eligible child must be enrolled at the UO. The staff fee privilege enables eligible employees and/or dependents to take up to 12 credits per term at 30 percent of the in-state resident tuition cost. For additional information on eligibility and forms for the staff fee privileges program, please see the Human Resources website. Under the expanded sabbatical benefit, compensation will increase from 85% to 100% for a third of a year (4 month) sabbatical for UFM who are eligible to receive a sabbatical benefit. Additional lengths of leave and compensation are also available depending on the school, college, or other administrative affiliation. Represented faculty members also receive this new higher sabbatical compensation under a collective bargaining agreement negotiated last fall. For more information on sabbatical leaves please see the Academic Affairs website. I again want to thank all the employees of the University of Oregon for all that you do to make this a premier public research university. Here in Oregon, President Gottfredson’s General Counsel Randy Geller tried to remove protection for faculty who criticize the university administration from the faculty union bargaining agreement – but failed. And now President Gottfredson is working with a faculty committee from the UO Senate to further strengthen those rights. Which is good. 8/7/2013: Full pdf here. It took 2 months, $214.50, and a petition to Lane County District Attorney Alex Gardner to get UO General Counsel Randy Geller to produce these. Contributions are welcome at the link on the right. These redactions look rather random and, given the extent to which the administration has talked about these issues in public, unlikely to be protected under attorney-client privilege. 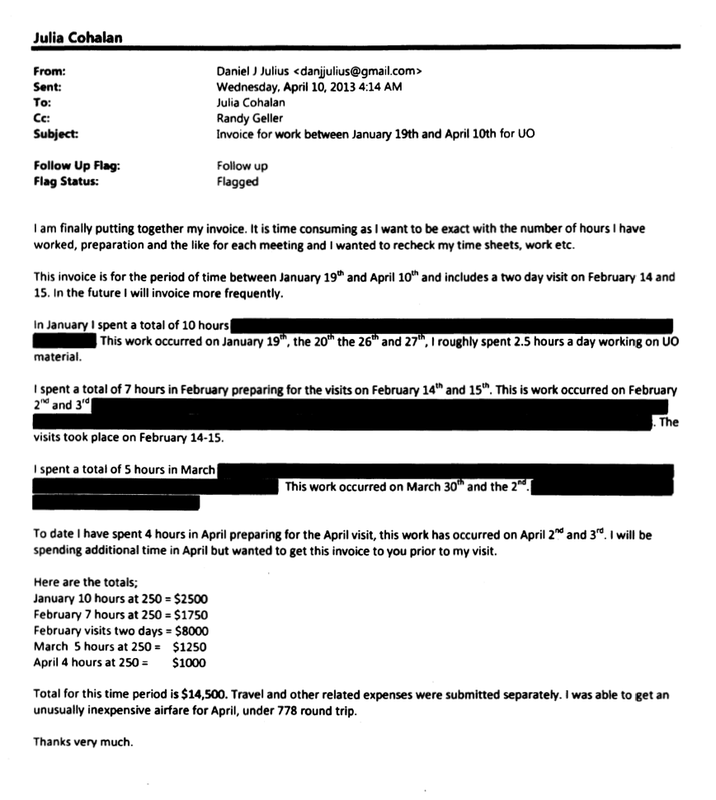 The Rudnick invoices include $14K or so a month for “consultants”. Presumably that’s for Dave Frohnmayer’s former assistant and current HLGR lobbyist Marla Rae, for ghostwriting Barbara Altmann’s fact-checks and negotiating reports. No idea why we’re still paying the Kraemer firm – Berdahl had hired them for union-busting, we saw how that worked out. 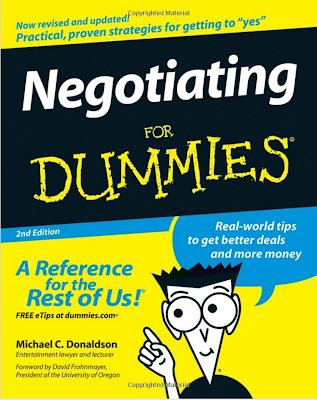 Dan Julius is a moderate, presumably advising the administration on how to cut a deal with the union. Comments welcome, I’ll have details later. Meanwhile, it looks like the administration is paying about $100K a month to outside lawyers and consultants to do the bargaining with the faculty union. 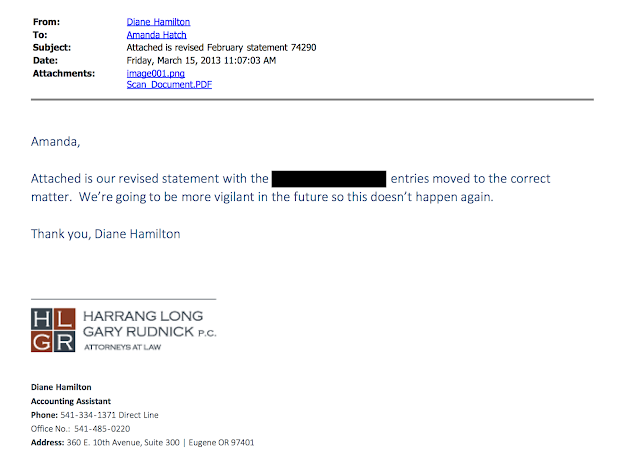 Bargaining XXXVI: Rudnick violates UO respectful workplace policy? Thursday 8/29/2013, 9am-4pm, room 122 Knight Library. The admin team’s fact-check on this post should be quite interesting. Lead admin negotiator and noted tobacco company lawyer Sharon Rudnick violates UO Respectful Workplace Policy? If you’d showed up you’d probably know what I’m talking about. Don’t miss the next session: Tuesday, 9/3, 10AM. Your chance to get more verbal abuse, and hear President Gottfredson’s counter-proposal on raises. The University of Oregon is noted for its strong tradition of collegiality and support for all members of the institution. Hostile, intimidating or abusive behavior damages the strong sense of community so valued at UO. Please join us in working to ensure that each member of our community benefits from a respectful and inclusive working and learning environment. We recognize that the demands of our jobs and stressful challenges in our work and personal lives can occasionally lead to moments of impatience and irritability. However, we want to take this opportunity to remind you that, regardless of the provocation or reason, it is never appropriate or acceptable to vent frustrations or conduct workplace business by yelling, using profanity or acting in a demeaning or verbally abusive way. 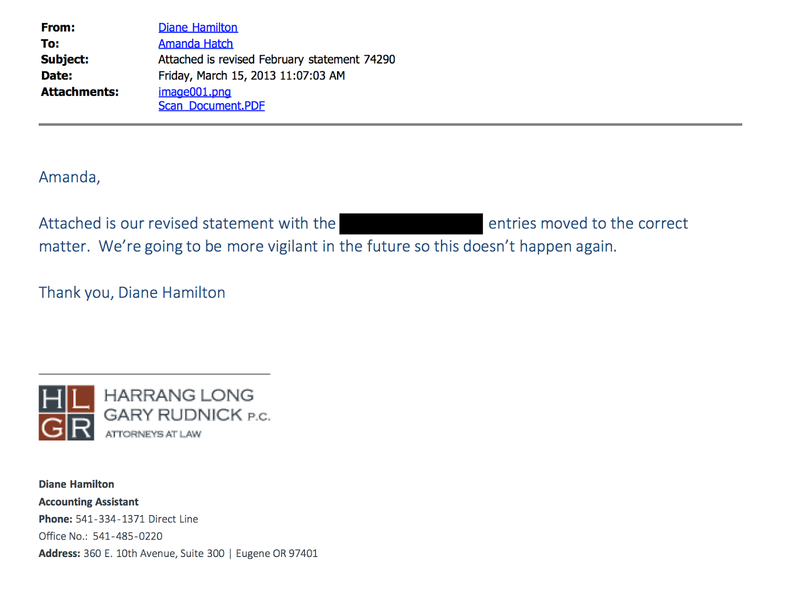 Blandy’s email is dblandy@uoregon.edu if anyone wants to file a complaint about his co-negotiator. Some chatter about discipline for Rudnick over her disrespectful treatment of faculty and library staff this morning. Does UO’s respectful workplace policy apply to $300 an hour lawyers? Any truth to the rumor someone caught that on a cell phone video? Email me at uomatters or just post it on youtube already. The faculty union needs you to show up at this session for as long as you can. The union team will put its latest counter to Gottfredson and Coltrane’s 3.5% a year proposal on the table. Check out the data by rank and department. You are a long, long way from the Lariviere targets, and 3.5% a year is not going to cut it. If you want to get a real raise, you need to show up and help put on the pressure. Word is that the much maligned part-time yoga instructors will be there to help out with stress reduction during the caucus breaks. Bring your mat, and be prepared to chant. Gottfredson is paying Sharon Rudnick and the admin’s other lawyers and consultants about $100K a month, from the state and tuition funds, to fight with the union over raises that are smaller than what Scott Coltrane was ready to implement 2 years ago as Dean. VPFA Jamie Moffitt is piling up reserves, but says UO is too broke to keep to the plan to get faculty to AAU comparator salaries. 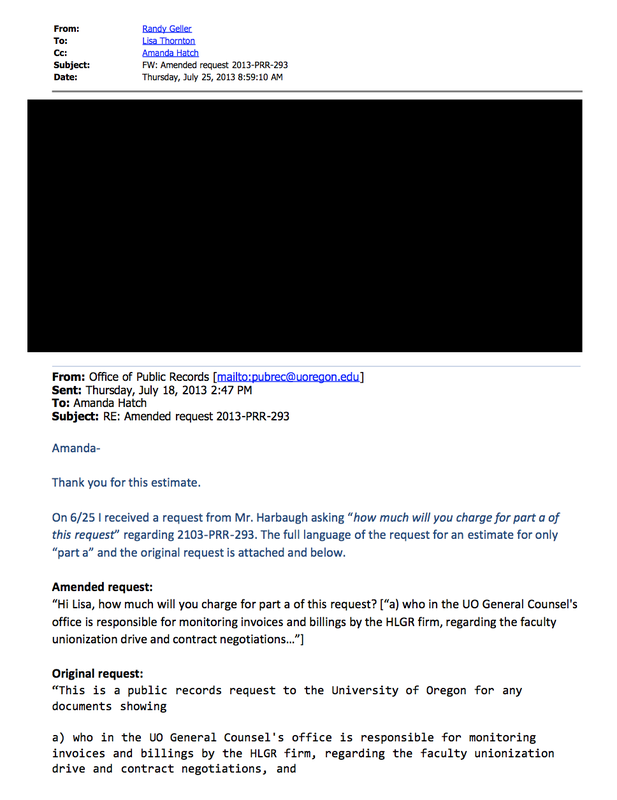 Gottfredson refuses to share basic UO financial info with the faculty, or even ask for their input on his performance review. No action from Gottfredson on Senate resolution to end millions in athletic subsidies. Including the $138M Quack House, 75% of this year’s donations to UO are for athletics. UO and its Foundation refuse to release details. Rumor has it that JH is holding back on its own raises until after the union contract is signed. 9:04. Looks like 50 people so far. Rudnick is telling the faculty they can’t sit behind the admins – don’t want us seeing the transcripts they are taking down. Admins walk out looking pissed. Cecil lays down the rules: It’s the library: whisper. No eye-rolls, those really drive Rudnick batty. 9:22: They’re back. Blandy, Rudnick, Gleason, Grado, stenographer. 1) Work to do: IP – big disagreements. Workload, career paths, job security. We think we can both make reasonable compromises. 2) More difficult: Governance. We’ve had the Senate, but faculty have now voted to also be represented by UA. What led to that was an unfortunate history, not your fault. Admin believed faculty were not constructive on admin matters, faculty thought admin was incompetent. Key to success is to *not* supplant Senate, but to provide support for its role. Admin sees union as distinct, not as a partner with the existing forms of shared governance. (Too true – see Gottfredson’s rejection of Senate vote to get union support for constiution.) For nomenclature, faculty see themselves as the heart of the university. The faculty are dealing with the university administration – not The University. Nomenclature is not a game stopper, but it’s symptomatic of problems in your approach. Librarian enters and says there are so many people it’s a fire code violation. She sends us to Room 101. Rudnick says this not consistent with ground rules, but OK. But Rudnick is out in the hall telling Mauer “I am not going to bargain in a classroom. This is not acceptable. There are rules!” Say, where are the administration’s supporters? Cecil calls a caucus: Mauer tells faculty what Rudnick said. Faculty member says “So, she wants us to take this outside?” Mauer gives him a stern look, tells us there will be decorum, goes back out in the hall to work his magic on Rudnick. Mauer comes back in, after a frank and open discussion with Rudnick. He told her the faculty came to see bargaining. (And practice for a strike?) A junior faculty member asks why Rudnick yelled at him when he tried to help move chairs. Says he’s never seen that sort of nasty intimidation. I’m guessing it’s his first session with Rudnick. Mauer: “Now you understand the problem of having to switch classroom in the middle of a session”. 3) We have counter-proposals for all the economic proposals. You’ve said repeatedly that you’ve already spent the faculty’s money. We’ve made some compromises, here they are. New proposal cuts promotion raises from 10% to 8%. Keeps 3% pool for NTTF floors – unacceptable that a full time university instructor would make less than $36K. Rudnick says “I’m chuckling about you saying you’d be happy for us to pay you more.” A $300 an hour lawyer without a clue. The crowd is stone cold silent. Mauer: I’d now like to give you the rest of our economic proposals and then have discussion. Rudnick: OK.
Mauer: We’ve dropped the child care benefits in an effort to reach an agreement. Rudnick: So we’re in agreement except for the part where you call us “The University of Nike Administration” instead of the “The University”. Mauer: Yup. Mauer: We’ve dropped request for a $1M fund to help get benefits for part-timers. We dropped this in order to focus on salary issues. About 100 faculty in the room. No admin supporters are noticeable. Blandy and Gleason still haven’t spoken. Mauer: Nothing new here, we can’t do much about PERS. We are concerned about threats that UO might drop the 6% pickup. Other bargaining agreements specify that if this happens employees will be made whole. We won’t agree to less of a commitment from UO, unless you can give a coherent explanation for why we should. Rudnick: That’s it? I’ll respond. For the 6%, admin would agree to shift it to salary if possible. But if legislation prohibits the pickup and takes money away from UO (come on, how much money does the state give us now?) we can’t agree to make you whole. We want you peons to face the risk, rather than have the university bear it, for example by perhaps having to cut Jim Bean’s sinecure, or cut back on athletic subsidies. That would be too much for JH to bear. Mauer patiently explains optimal risk-sharing theory to Rudnick. Blandy looks interested, Gleason has his head down, reading UO Matters. Rudnick doesn’t understand risk-sharing. (There are two possible states of the world …). Cecil starts running circles around Rudnick, giggles from the crowd. So why can other Oregon universities manage to make this commitment to their faculty, but not UO? Rudnick starts trotting out $8M cost figure. That’s less than 1% of the UO budget. Green and Rudnick have a productive conversation. Turns out the language does not apply to ORP people – got to check that out closely. 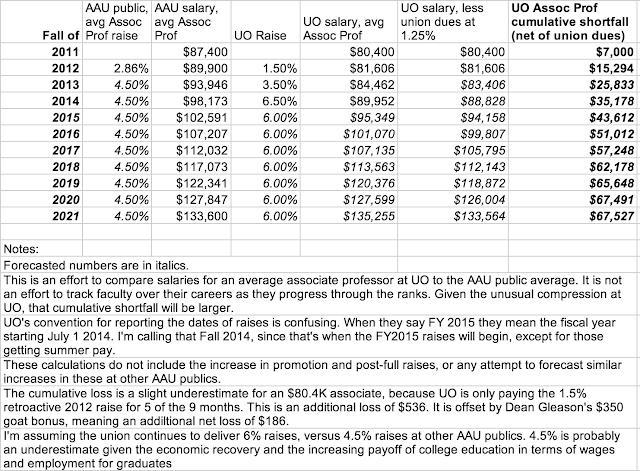 Rudnick’s basic argument is that individual faculty are better prepared to bear the risk of having to pay the pickup cost than UO, currently sitting on ~$150M in reserves. It’s a stupid argument, but it’s hers and she just loves repeating it. Which is really dumb, because the more she says it, the more people in the room start understanding how wacky it is. Rudnick: Budgets are tight. We could learn how to do better with what we’ve got, starting with optimal risk-sharing, but we’re too stubborn to listen to you on how to do it better, so I’ll just repeat my usual blather. Which she does. The crowd breaks out laughing. Now she’s off on the university’s tight future budget. The projections for which she won’t share with the faculty. Shameless. “Tim Clevenger’s new job is not new, it’s part of an effort to reduce administrative costs, and those are substantial!” No kidding. I couldn’t make that one up. Cecil: We’re trying to codify what you’ve told us is current practice. People under 0.5 FTE don’t get sick time, but they don’t typically get docked for missing class for legitimate illness, or have to pay for a substitute, so long as they make it up. Cecil: Paid 6 weeks parental leave: Suppose 1 parent works at UO and the other at another firm. Both could take family leave. We want to make sure they can do the same if both work at UO. Rudnick: OK. Some back and forth on faculty on grants getting vacation time. Blandy keeps his mouth shut. Rudnick says she’ll go back to her handlers and find out what’s up. Art 31: Release time for union officer and negotiating team. Mauer: We’ve cut the number of releases UO grants to faculty for union work to 2.5, plus 2 more for bargaining. But, we insist we need the right to buy additional time from the university on the same terms as the university gives releases for other administrative work. We want a union that’s run by the faculty, not paid staff, this will help us do that. Rudnick: Would UO get to have input, in case releases put a burden on one department? Mauer: Sure, we want to do this cooperatively. Bramhall: Course buyouts happen all the time, let the union do it they way department’s typically do it. Sometimes % of salary, sometimes replacement cost of an adjunct, etc. Gleason: Prices would be negotiated case by case? Cecil: Yeah, if there’s no set rate. We could set a rate, if that’s easier for you. Blandy: Release time usually requires Dean approval. Cecil – sounds reasonable, lets work it out. Rudnick: OK.
Big change in the level of cooperation from the admins here – good sign. 60% for full year, 75% for two quarters, 100% for one. (Change from current 80%). Cecil: Caucus break? Rudnick: We’ll be back on these on Tuesday. I was told by Scott Coltrane to tell you that we appreciate your significant movement on this proposals. We appreciate it. So, there you are. Mauer: Some upheaval at AEI, raises concerns that if these are not addressed it may disrupt the bargaining process. Some refusals by the admin to explain what’s going on. We’re proposing substantial changes in use of adjuncts and NTTFs. Once we have a contract, we expect it will include stronger definitions of adjunct and career. People who are currently adjuncts will move to career. 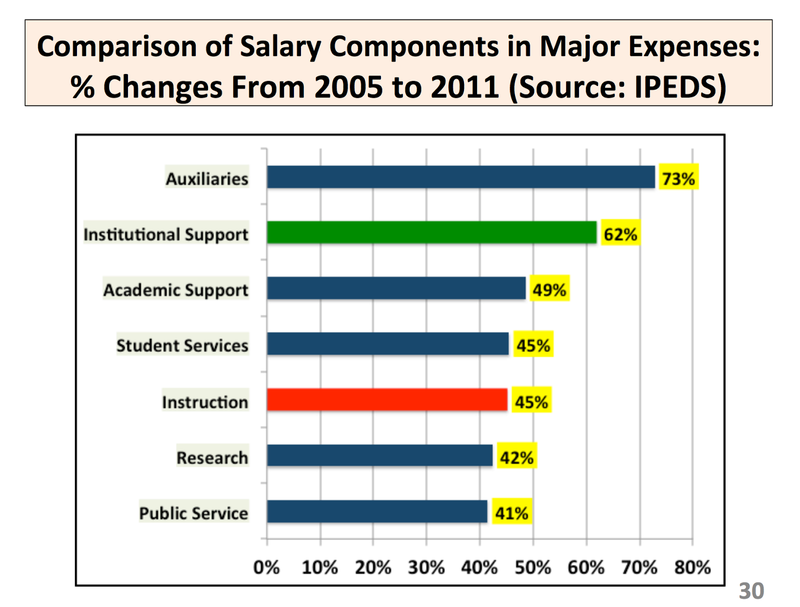 At AEI, some current adjuncts are now being told it’s up or out. Aside from the legal problems with what’s happening, it’s disruptive. Related problems with reducing contracts from 9 to 3 months, and the date to report for work has been changed. Finally, there are rumors about contracting out the entire operation. This would substantially affect what we need to address at the table. Rudnick: No plan to disband AEI. Some thoughts about looking at tuition structure. Regarding the reporting change, they are being paid and they have to be available for training and meetings. It may be a chance in that no one has ever done it before. As for contracts, it remains that the AEI contract will not be up or out. They are creating 15 career positions, trying to move adjuncts into them. For the specific cases you mentioned on the phone, the woman will get a contract for fall. For the man, they can apply for the career position. We will sit down with them at $300 an hour and make sure they handle the transition to career positions better, since they seem to have some issues. Mauer: Thanks, we appreciate it. Rudnick: We will also figure out contract terms. Mauer: We’ve made a substantial move on the economics, we wanted to send a clear message and we expect reciprocation. Rudnick: I’ll meet with Gottfredson and Geller and Moffitt tomorrow morning, and we’ll get something done. Appeals for promotion and tenure: Gleason speaks, Rudnick shuts him up, he looks pissed. Some stuff about what happens if new stuff comes to light during appeal – book gets accepted, etc. Cecil: Under current law if denied tenure you can pursue a grievance and a civil case. You want faculty to pick one or the other? Rudnick: Yes. More back and forth on details of tenure denial grievance process. Art 49: Acceptable use of UO information assets. Admin counter. In their Art 49, the admins assert ownership of all information stored by faculty on UO info systems. The old policy? The state may or may not have a property interest in information stored on University systems. Mere physical presence of information on a University electronic information system is not sufficient to conclusively establish the ownership and control of that information, just as physical presence of a paper document in a faculty member’s desk or filing cabinet does not establish an irrefutable presumption that the document is owned or controlled by the University. Rudnick: Gleason found a typo on line one, good boy. We are trying to fix some of the more egregious claims in our previous proposal. But, they still claim UO owns everything you store on a UO computer or network unless otherwise expressly stated in the article, and they can take away internet access if you misuse it. Crowd breaks out laughing. Cecil: You’re insane, but if you want to claim the right to do this, it’s discipline, it’s grievable, and we’re going to want to see what UO administrators do with their computers too, to argue it’s not disparate treatment. Green: You’re serious about claiming you own family pictures and MP3’s I store on my UO computer? Rudnick: Yes. You own them too. (WTF?) We asked Geller about the practicality of this – carry two computers with me. Rudnick: That’s why I carry an iPad. Seriously? 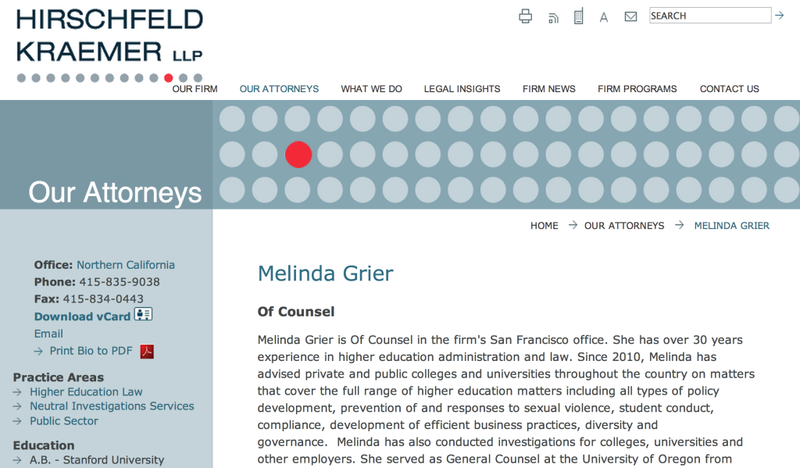 She’s using her experiences at a law firm where things are subject to discovery to tell faculty at a university what to do? Davidson: I understand that UO has a reason to access what’s on a computer for legal reasons – but why insist on ownership? Rudnick: Some of that will have to be addressed in the Intellectual Property article. 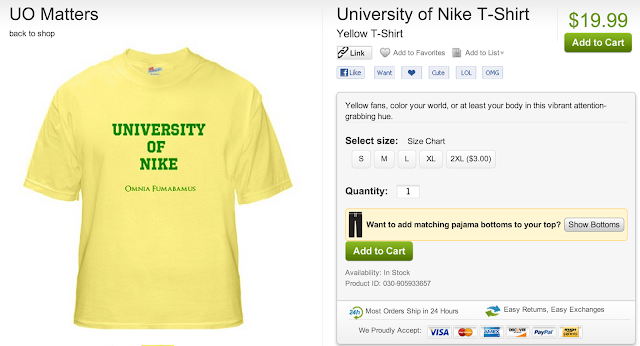 But the default is it belongs to UO. Remember, at the moment UO has no written policy or procedures regarding who in the administration can read your emails or your files or for what purposes. Gleason: What if I create on my UO computer but store on the cloud? I read this to say it’s mine. Cecil: Suppose I post an anonymous comment on UO Matters? There’s a long tradition on the constructive use of anonymity for public comments. (Yup, back to at least Silence Dogood, a.k.a. Ben Franklin. Rudnick: OK, come back with better language. Rudnick: Even what you do at home on your own computer is a public record by Oregon law if it is related to you work at UO. Mauer: Is complaining about work “work related”? Rudnick: No. Rudnick: Work related stuff is public records and you don’t own them. (Really? She’s confused. You can own them but they can still be subject to disclosure and vice versa. Cecil on it: Why can’t faculty have an expectation of privacy? Rudnick: A bunch of reasons. Work of the university, monitor university discipline, etc. Cecil: Why not a rule saying you have some expectation of privacy – e.g. prior notification. Rudnick: We’d agree to notification after the fact. We are trying to be very clear: The default is that we own it. Cecil: Suppose I own it and store it on computer – e.g. class notes. We’re going to propose some exceptions. Gleason: Your class notes are a public record. Rudnick: Maybe not Tim. Bramhall: So, if I do personal stuff on a personal computer hooked up to a UO network, I do have an expectation of privacy? Rudnick: Yes. Davidson: Would you be open to limiting searches to cases where there’s a reasonable suspicion or public records? Seems unreasonable for there to be *no* expectation of privacy. Section 11: No using UO computers or networks to sell University of Nike t-shirts. Rudnick appears to have second thoughts on all this: Maybe we should take a bunch of this out, and just reference the law? Rudnick making some concessions. Blandy still hasn’t spoken, but does nod occasionally. All this sounds good for the AEI folks. Quick break, come back for IP. Art 51, Intellectual Property, union counter. Cecil: So, if we faculty are paid to teach students, does the university then own the students? Or just their brains? Pratt: Idea is founded in academic freedom, and the idea that the business of the university is to help faculty in the creation and dissemination of knowledge, not to control that knowledge. Rudnick: We own you and what you do. We get to profit from it, not you. You’re talking about academic freedom, not intellectual property. Gleason: I’ve actually done my homework this time and read the AAUP stuff. We hire in the sciences, invest $1M in startup. Your proposal will mean we have to write a separate agreement for each such hire. You’re right, our proposal is draconian in the opposite direction. So, we need a compromise that’s workable. Rudnick is so used to Gleason not making sense she even interrupts when he does. Cecil: This language is from another university contract – they seem OK with it. Why not UO? Rudnick: Sec 6 says it’s up to the BU member to disclose. Olson: This comes from the standard Dept of Commerce deal, required by patent law for things developed by federal funds. Rudnick: Sec 6 does not give ownership, just requires disclosure. But you want faculty to ave ownership. Cecil: Maybe you should work on better language. Olson: Which law do you think this is consistent with? Rudnick: I don’t think it’s useful to talk about the law. My approach is more pragmatic, lets make a deal. Mauer: I get it that you think it’s consistent with the law, Sharon. So are other ownership arrangements. So, what law are you talking about? Rudnick: We can agree to very different ownership rights. Olson: Look at the Stanford case, where the SCOTUS said university did not own IP, but could work out arrangements with university. UO currently does this well. Why do you want to mess this up? Mauer: How much money is involved? Rudnick. No. But we’re worried about owning on-line courses, don’t want faculty to take them somewhere else. Cecil is all over Rudnick on this. My thought: We are going to end up with different rules for faculty in the bargaining unit and out of the unit. And since people move in and out, it’s going to be a mess. Gleason: If I was hired by a corporation to do work, they’d own it. The university is just like that corporation. …. He’s slowing down, realizing this isn’t going in a good direction. Pratt tries to make it clear to Gleason that universities have a slightly different social mission than corporations do. Gleason: I don’t get the connection between academic freedom and intellectual propoerty. Cecil: As technology progresses and the amount of money at stake increases, so does the importance of this. We’ve got competing interests, need to make a compromise. Rudnick: I agree, let’s ignore the law which is very unsettled, and cut a deal. Cecil: University currently shares 50/50 – why do you want to change it? We need more explanation – maybe we should get Randy in the room? Rudnick: We spent the morning on economics, we’re going to cut a deal. But in exchange the university wants the money from your IP. So, we’re frustrated with you. Almost 4:20, they’ll be back Tu at 10AM with a counter on raises. Be there. 8/14/2013 update: Finally got one page from Geller’s office on HLGR billing issues, in which Rudnick’s firm promises to be more vigilant in the future. 6/23/2013. 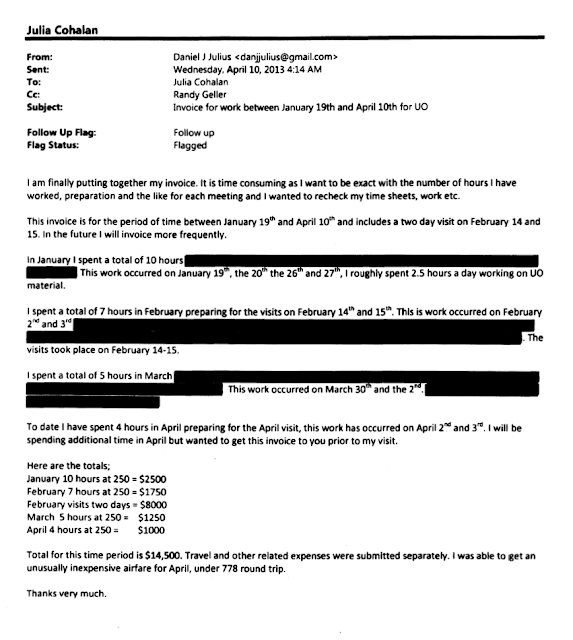 Surely someone in Randy Geller’s GC office has responsibility for looking over the billable hours, checking productivity, asking questions about the inevitable little mistakes that creep into the invoices, which now must total pretty close to $500K. But more than 6 weeks after I made the public records request below, Geller’s office still won’t even release the name of the person in charge of this. I have not received any response to this public records request, sent to your office more than 2 weeks ago. I would appreciate it you could let me know when I can expect a response. I made the public records request below to UO 3 weeks ago. I haven’t received any substantive response. This is a petition asking the DA’s office to treat this delay as a denial, and to order UO to produce the requested public records without further delay. The University of Oregon has received your public records request for “a) who in the UO General Counsel’s office is responsible for monitoring invoices and billings by the HLGR firm, regarding the faculty unionization drive and contract negotiations, and b) any audits done by the UO General Counsel’s office, and any documents showing questions about rates, expenses, work effort, time-keeping or other similar issues, and their resolution, for invoices submitted for this work by HLGR. This request covers the period from 9/1/2011 to the present” on 06/04/2013, attached. The office has at least some documents responsive to your request. By this email, the office is providing you with an estimate to respond to your requests. The office estimates the actual cost of responding to your request to be $322.12. Hi Lisa, how much will you charge for part a of this request? At the recent Senate STC meeting Dave Hubin said that you routinely worked with requestors to get requests in under the one hour time limit for a fee-waiver. You’ve said the same at PR AAG meetings. I’d appreciate it if you could respond to my question below regarding part a) of this request, and also let me know if I could get some subset of the documents in part b) under the hour limit – perhaps just the documents showing billing audits or monitoring from, say, 7/1/2012 to the present? Hi Lisa, can you let me know if you are not going to reply to the email below? It’s now been more than 2 weeks (OK, it was 10) since I first asked for help with reducing the scope of the request. 7/12/2013, she’s working on it. The office is working on an estimate for part a) of your request. The office is unaware of a way to provide you with a subset of the documents requested in part b) of your request under the hour limit. However, you are welcome to submit a new public records request for the documents you suggest below. Any progress on this estimate? It’s seems like a simple request, really I just need a name from the General Counsel’s office. But’s its now been more than 3 weeks. Is the hold-up in Randy Geller’s office? 7/24/2013: Still no response. Fifty days since the original request and I still can’t even an estimate on the cost of getting the name of the person in Geller’s office who is in charge of monitoring the bills from Sharon Rudnick, which are now approaching $750K. Anyone got any suggestions on what to try next? a request for the “football game contract” or other similar document or documents between the University of Oregon and Nicholls State for the game scheduled August 31, 2013, that includes the terms and conditions, compensation, officials and telecast agreement for the game. Want to get a copy of the contracts and job descriptions for Lorraine Davis and Jim Bean? It’ll take weeks. 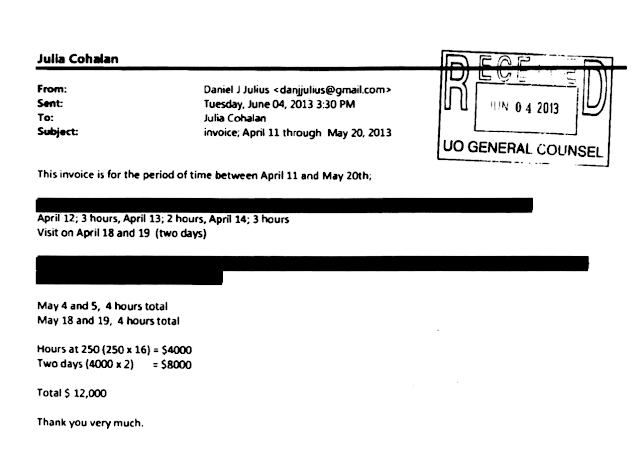 Want to find out how/if Randy Geller’s office is auditing the $100,000’s in HLGR invoices? All told I’ve now been waiting 2 months for info on this. What are they hiding? Thank your for the response below. 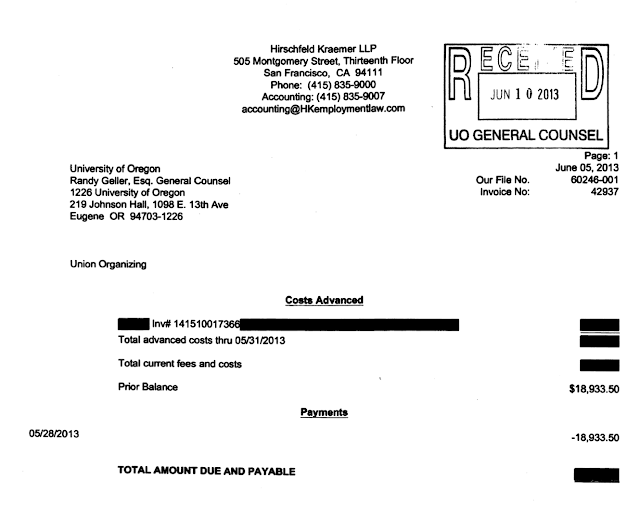 It seems entirely unreasonable for UO to charge $322.12 just to release the name of the person in Randy Geller’s office that is responsible for monitoring HLGR invoices, though after 50 days on this one request, I do get the idea that it must be a sensitive question. Surely that can’t take more than an hour.